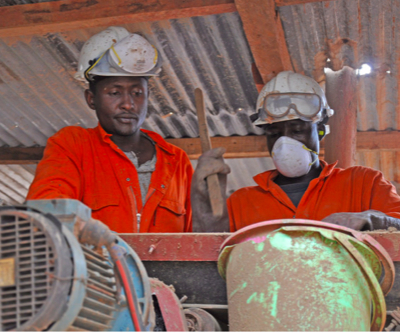 The Kilimapesa mine, in Kenya, has been operating at reduced levels to limit costs during the period. African miner Goldplat (LON:GDP) revealed Monday a widening of its half-year losses on the back of a steep revenue decline, as sales have been hit by weak gold prices. The company reported an operating loss of almost US$1.2 million (£694,000) for the six months ended December 31, from a profit of US$3.4 million (£2.05) in the first half of the previous fiscal year. Goldplat’s chairperson Brian Moritz said even achieving the same volume of gold sales registered in 2012, the firm would have lost income, as bullion traded at about $300 per ounce lower than in the prior fiscal year. However, the group was more optimistic about the long-term future, revealing that the second half of the fiscal year was already performing more strongly and as such it expects, in line with market expectations, to return to profitability by the year-end. The miner’s exposure to gold price fluctuations is eased by the fact that it can adjust the price of gold bearing material it buys, which puts it at an advantage compared with a mine reliant on a finite ore body. However, the group explained the effects of this mitigation are not immediate. The company also said it continues to examine joint venture opportunities to redevelop its Kilimapesa mine in Kenya, subject to proposed legislation that is set to clarify rules for local participation. The Kilimapesa mine has been operating at reduced levels to limit costs during the period, but Goldplat said it is talking to potential partners to carry certain capital costs for expansion at Kilimapesa. Kilimapesa has a mineral resource of 8,715,291 tonnes at 2.40 grams per tonne of gold for 671,446 ounces of gold at a cut- off of 1 gram per tonne. Goldplat shares were up 13% early Monday at 5.65 pence.